CDC is now expanding its operations internationally with a focus on energy and hydrocarbons, utilities and infrastructure, urban development, and hospitality. Construction Development Company being featured on 'Qatar, A Revolutionary Nation', US Television. The feature was also aired on Fox Network. Flymi.com is the flagship online travel portal of Millennium Travel. This easy to use portal is launched to cater to the needs of the next generation travelers, who wish to have complete control of their travel plans. Our Mobile application empowers travelers to access their preferred services anywhere anytime. The portal will display a complete list of all airlines and their real-time prices to choose from. CDC eagerly embraced the challenge to create another artwork of engineering - yet in the hitherto unfamiliar field of 5-star-plus living. With The St. Regis Doha and Al Gassar Resort project, CDC did not only break new ground, but moved way beyond previous handicraft and ingenuity. The result is an extraordinary oasis of luxury and well-being to fulfill every guest's wishes and needs. An achievement all documented in a special CDC-edition which is ready now to be studied. Enjoy! View our St Regis special! CDC's Lifestyle Select concept in Qatar is presenting Steinway Lyngdorf at the Pearl Qatar. A Hi-Fi product of a visionary ambition and uncompromising quality commitment – a shared dream which brings Steinway & Sons, makers of the world's finest pianos for 160 years, and Peter Lyngdorf, one of the most forward-thinking audio innovators of our time, together. We embrace music and our desire is to bring its pinnacle of enjoyment into the homes of our discerning clientele. Steinway Piano Gallery Qatar is also proud to announce that we are producing in an exclusive partnership with CrystalRoc the world's most exclusive pianos currently on the market: original Steinway & Sons grand pianos fully encrusted with genuine Swarovski crystals. 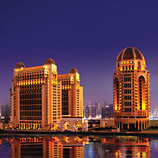 A remarkable new project of CDC is the Marsa Malaz Hotel at the Pearl Qatar. The work consists of Procurement, Construction, Completion, and Maintenance of the proposed hotel building along with Electromechanical and Landscaping works including external services. Developing a State-of-the-Art Warehouse in the shortest possible construction time. This was the brief for the new Qatar Foundation Offsite Warehouse and Distribution Centre in the Salwa Industiral Area. The project works comprise of Design (of the Pre-engineered structure), Procurement, Construction, Testing and Commissioning. Handover of "Kempinski Residences & Suites, Doha" on West Bay Doha, Qatar The Kempinski Residence & Suites - Doha is currently the most breathtaking project of Qatar's tower section. This project required abilities way beyond original construction work. With its handover CDC again proved its wide scope of skills concerning professional project management on a construction site and, further more, the company's expertise when it comes to building outstanding residences.